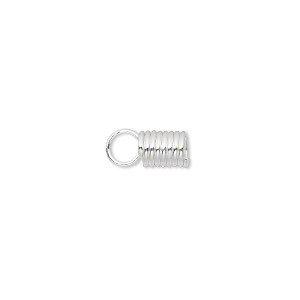 Cord coil, silver-plated brass, 11x2mm with loop, 1mm inside diameter. Sold per pkg of 100. Item Number: H20-2194FN Have a question about this item? Use with any size appropriate cord. A coil with a loop on one end works great for terminating cord necklaces or multi-strand beaded necklaces. These are designed for crimp style attachment. 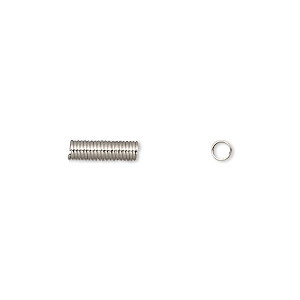 For another great beading component, thread these on as unique spacers for use in earrings, necklaces and bracelets. 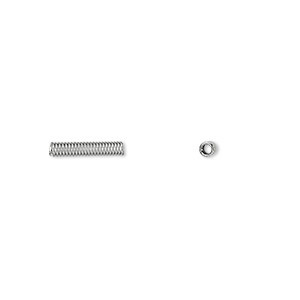 Cord coil, silver-plated brass, 11x3mm with loop, 1.75mm inside diameter. Sold per pkg of 100. Cord coil, silver-plated brass, 10x2mm, 1mm inside diameter. Sold per pkg of 100. 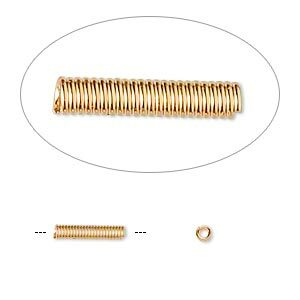 Cord coil, gold-plated brass, 11x2mm with loop, 1mm inside diameter. Sold per pkg of 100. Cord coil, silver-plated brass, 10x3mm with 2mm inside diameter. Sold per pkg of 100. 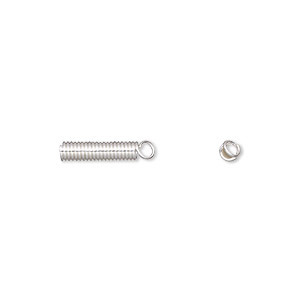 Cord coil, imitation nickel-plated brass, 11x3mm with loop, 1.75mm inside diameter. Sold per pkg of 100. Cord coil, gold-plated brass, 11x3mm with loop, 1.75mm inside diameter. Sold per pkg of 100. Cord coil, nickel-plated brass, 10x3mm, 2mm inside diameter. Sold per pkg of 100. Cord coil, glue-in, stainless steel, 7x2mm with loop, 1mm inside diameter. Sold per pkg of 50. Cord coil, gold-finished brass, 10x2mm with 1mm inside diameter. Sold per pkg of 100.